The long-awaited mass market paperback of A DANCE WITH DRAGONS hits the bookstores today. (Yes, we know you folks in the UK, Australia, South Africa, Ireland, New Zealand, and like places have had the UK mass market for ages, thanks, you can stop gloating now). 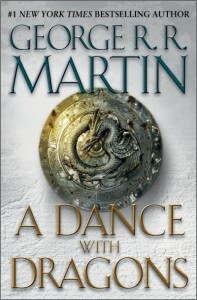 And yes, the paperback of DANCE does include a sample chapter from THE WINDS OF WINTER. A lot of folks have been clamoring to know which one, and now it can be revealed: we've included the first Ser Barristan chapter from the novel-in-progress, wherein we glimpse the beginning of the Battle of Meereen. I hope you will all enjoy it. The dragons are not flying alone, either. 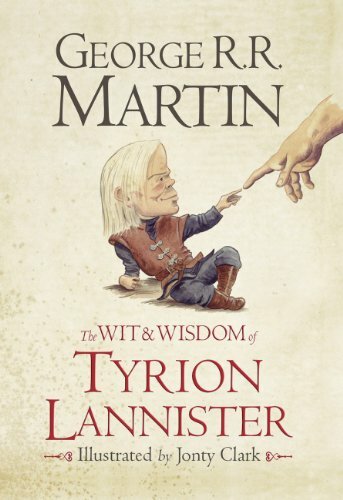 Also hitting the racks (and virtual racks) this morning in both the US and the UK is THE WIT AND WISDOM OF TYRION LANNISTER, a little hardcover stocking stuffer collecting most of the Imp's best (and worst) lines from the five novels published to date, illustrated by Jonty Clarke. This one is meant as a Christmas book of sorts, small enough to slip into a stocking (if you have very big feet). We hope you get a kick out of it. And who knows, if our little venture meets with favor, perhaps next year we will do THE WIT AND WISDOM OF HODOR. DANCE and WIT & WISDOM are both available at a bookstore near you, or from your favorite online retailer. Yes, it's true. Your wait is over. A DANCE WITH DRAGONS will finally be published in paperback, next month. The paperback release has been delayed again and again, I know. (Believe me, I've received a lot of emails about it). This was done largely at the request of the bookstores. The hardcover was still selling strongly (still is, actually), so they wanted the paperback delayed. But no longer. On October 29, Bantam Spectra will release DANCE simultaneously in trade and mass market paperback editions. And yes, the paperback will include a preview chapter from THE WINDS OF WINTER. (Though at this point it has been so long that I've forgotten which one it is). October, by the way, looks to be a huge month for me. 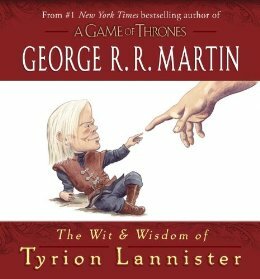 Besides the DANCE paperbacks, I also have OLD MARS coming out that month, and the MEATHOUSE MAN graphic novel, and a little Xmas book called THE WIT AND WISDOM OF TYRION LANNISTER. But more about that one later. A DANCE WITH DRAGONS is on the list, hanging in there at #10 in hardcover bestsellers. Which is not news by itself. DANCE has been on the list for a long time, moving down, moving up, but never quite falling off. For 52 weeks. That’s the news. DANCE has been on the NYT list for one full year. I never could have imagined this, not in my wildest dreams. Thank you to me editors and publishers, past and present, to Anne Groell, Scott Shannon, Nita Taublib, Jennifer Hershey, Irwyn Applebaum, to my valiant and tireless publicists David Moench and Chris Artis, and to all the other great folks at Bantam Spectra and Random House. Thank you to all the critics and reviewers, who gave the book such outstanding notices, not to mention all sorts of cool awards. I have never had a book better reviewed. Thanks for all the journalists and feature writers and bloggers who conducted interviews, ran contests, and helped spread the word. Thanks to the Brotherhood Without Banners. Fans and friends, AND they throw the best party at worldcon. Thanks for all the booksellers and librarians everywhere. You’re all heroes. Thanks to Mike Lombardo and Sue Naegle and Richard Plepler and Mara Mikilian and all the rest of the great folks at HBO, and thanks especially to Brian Cogman, David Benioff, and Dan Weiss, to Peter Dinklage, Emilia Clarke, Sean Bean, Lena Headey, Mark Addy, Jack Gleeson, Nicholaj Coster-Waldau, Sophie Turner, Isaac Hempstead Wright, Kit Harrington, Maisie Williams, Conleth Hill, Michelle Fairley, and the rest of the greatest cast on television, and to our amazing cast and phenomenal directors. A DANCE WITH DRAGONS would likely have made the NYTimes list without the GAME OF THRONES series, but beyond doubt, it is the show that has kept the books riding high for so long. You’ve all done amazing work. But most of all, thanks to you, my readers. You were the ones who bought the book a year ago when it first hit the shelves, and you are the ones who are still buying it today, and pressing copies on your lovers and kin, and telling your friends to buy their own copies. Luck can get a book on the list, even keep it there for a week or two… but only a long, sustained passion and great word of mouth can keep a title on the TIMES list for one solid year. So take a bow, readers. I owe it all to you. All I can say is… keep reading. The best is yet to come. I’m very pleased to announce that A DANCE WITH DRAGONS has won the LOCUS Award as the Best Fantasy Novel of 2011. I wasn’t able to attend the awards banquet myself, but Ty flew out (he was also nominated, for LEVIATHAN WAKES in the SF category) and accepted on my behalf. Presumably he will even bring me back the award, if I can pry it out of his fingers. LOCUS, founded by the late great Charles Brown, is the trade magazine of science fiction and fantasy, and has been the bible for me and a lot of other professional writers for decades. Their annual awards poll draws more votes than the Hugo and Nebula Awards combined. A DANCE WITH DRAGONS is the fifth volume in A SONG OF ICE & FIRE to be nominated as the year’s best fantasy by the readers of LOCUS, and the fourth to win. What can I say? Those LOCUS readers have really good taste. Thanks to the good folks at LOCUS, and to everyone who voted, whether it was for me or for one of my excellent fellow nominees. 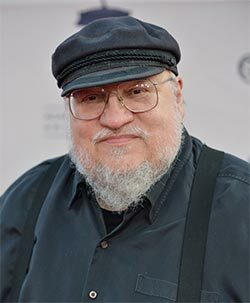 Last night in London SFX magazine announced the winners of their annual readers’s awards, and I am pleased and proud to report that A DANCE WITH DRAGONS won for Best Novel, and HBO’s GAME OF THRONES as Best New TV Show. I was not able to be in the UK for the awards (though I will be, come April, for Eastercon, and signings in Bath and London), so I taped my acceptance speech ahead of time. Thanks for everyone who voted… and to all my readers everywhere, who waited for the book so patiently, and have received it with so much enthusiasm and acclaim. What fine intelligent gentlefolk they are at USA TODAY. Forgive me, whilst I blush prettily. If I had a football to hand, I would gladly spike it. What good taste the folks at LIBRARY JOURNAL have. When I put up the post about my Portuguese publisher winning the gold medal for being the first to release a translation of A DANCE WITH DRAGONS (see below), a number of readers in Croatia wrote me to say, no, the Croatian edition was out first. I had not seen the Croatian edition, or even a jpeg of its cover… but now I have. They were right. Croatia was first. Portugal was second. Croatia gets the gold, Portugal the silver. (The bronze remains to be determined, so far as I know). Both Croatia and Portugal split the book into two volumes, and have thusfar released only the first half. Meanwhile, filming of the second season of the HBO series in currently underway in Dubrovnik, so Croatia is doubly blessed. A lot of Croatians have been hired as extras and crew, and a few have speaking roles as well. Portugal, on the other hand, gets a visit from me next spring. So everybody wins. I hope. Enjoy the read, whatever language you may be reading in. The first translation of A DANCE WITH DRAGONS is just out. And the gold medal for fastest translation goes to Portugal. Mind you, my Portugese publisher splits each book into two volumes, so this is only the first half of DANCE… but even so, the first volume is in the bookshops, and I’m told it has vaulted to the top of the Portugese bestseller lists. So… which country will get the silver medal? Spain? Italy? Germany? Your guess is as good as mine, but I’ll keep you posted. Meanwhile, back in the States, DANCE fell to #3 on the NYTimes list last week, and this week is down to #4. But still in the top ten, nine weeks after publication. Just got word from Bill Schafer at Subterranean Press — Marc Fishman has delivered the last of his artwork for their limited, illustrated edition of A DANCE WITH DRAGONS. Some 90 interior illustrations as well as the two covers and the other full-color plates. Those who purchased the limited (numbered or lettered) of A FEAST FOR CROWS have first right of purchase for DANCE, and will have until the end of September to place their orders. After that date, any unsold copies will be made available on a first-come, first-served basis to readers new to the series. Subterranean does NOT maintain a waiting list, so you can’t order now unless you are already one of the subscribers to the series. But there are always dropouts, so some copies should be available to newcomers. Not many, no, but some. If you hope to snag one of those, your best bet is to subscribe to Subterranean’s online newsletter, since that’s where their availability will be announced, come October. (And if and when you see such an announcement, ACT AT ONCE, or you’ll be shut out by those who do). As with previous volumes in the series, the Subterranean edition of A DANCE WITH DRAGONS will be limited to 448 numbered and 52 lettered copies, slipcased, and signed by me and by artist Marc Fishman. The lettered copies will also include remarques by Fishman. I have only seen a small portion of the art myself at this point, but I’m eager to have a look at the rest. Fishman is a major talent, and I don’t doubt that his vision of Westeros will stand right up there with the work of Jeff Jones, John Howe, Tom Canty, and Charles Vess on the first four books.